InvoicePlane can contain an unlimited number of user accounts (both Administrator and Guest), but there is no real level of ownership or separation between different administrator accounts. Each administrator account has full access to the entire system and can see all data system-wide. Guest accounts are read-only and can be restricted to see invoices, quotes and payments for the client or clients you specify. An administrator account has full access to the entire system. Administrators can create and delete clients, invoices, payments, users, and everything else in the system. The account created during installation is an administrator account. If you don't want somebody having full access to all of your data, do not create an administrator account for them. There may be times where you need to allow a user into your system, but with limited access. Guest accounts allow you to create a user account which can only view quotes, invoices and payments for one or more clients. A guest account may be created for a particular client, in which case you would create the account and grant access to only that client. A guest account may also be created for an accountant, in which case you might create the account and grant access to more than just one client. To view the user list, click the settings icon near the right hand side of the main menu and select User Accounts. The Options button at the end of each row displays a menu from which you can edit or delete an user. To add a new user account, click the settings icon near the right hand side of the main menu, select User Accounts, and click the New button near the top right of the page. To create the user account, provide the user's name (typically their full name), email address (this is what they'll use to log in with), password and password verification. When selecting the user type, choose between Administrator or Guest. Once the user type has been selected, the rest of the form will display below the initial form. 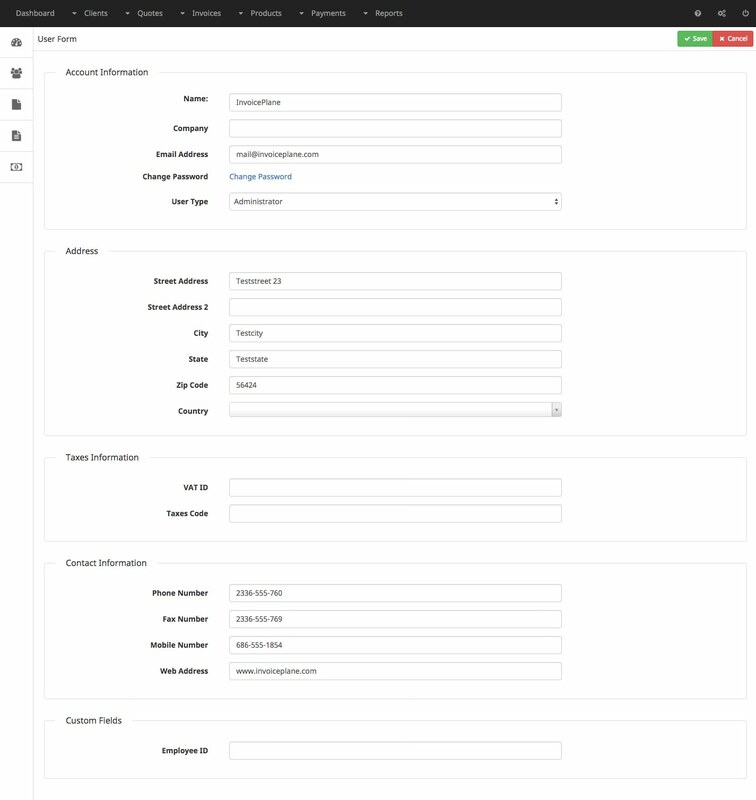 If Administrator was selected as the user type, several fields will be made available to complete, such as their address and location information and contact information. Fill in the fields and press the Save button near the top right of the page. If Guest was selected as the user type, an area will be made available from which you can give access to one or more clients for the Guest user account. 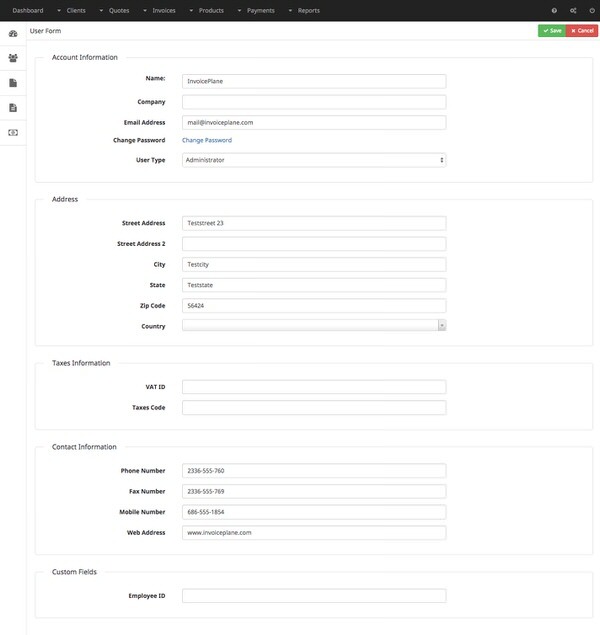 To provide access to a single client, press the Add Client button, begin typing the name of the client in to the form and select the client when they appear in the list. Press the Submit button. If you want you can add another client to the user account. If not press Cancel. Don't forget to save the user account. If a guest account is not a client, but instead an accountant, you will probably want to provide them with access to more than just a single client. In that case, press the Add Client button, begin typing the name of the first client in to the form and select the client when they appear in the list. Press the Submit button and begin typing the next client name. Rinse, wash and repeat until each client the guest should have access to has been added to the list. Press the Close button and then press the Save button near the top of the page when finished. No matter if the account is an Administrator account or a Guest account, all users use the same URL to log in. Be sure and provide your login URL to any users who you create accounts for.